Nigerian Society of Engineers (NSE) has said it is in forefront of the advocacy for the manufacture of Vehicle Speed Limiter Devices (VSLD) locally to boost the nations economy. The Society also said with a target of one million commercial vehicles at the rate of N40,000 per unit, the Federal Road Safety Corps (FRSC) will be making a huge N40 billion within the first 12 months of its enforcement thereby making a huge industry where several Nigerians can be gainfully employed if well implemented. The FRSC has began enforcement on the installation of the device since 1st of February 2017 with a target of 1 million commercial vehicles at the cost of N40,000 per unit which will translate to N40 billion in one year and possibly double the amount the following year. President of NSE, Engr. Otis Anyaeji, who said this in Kaduna during a public lecture organized by the Auto and Locomotive Engineers Institute (AutoEI) urged the FRSC to carry Nigerian engineers along as they are equally to the task. Represented at the lecture by Vice President Engr. Dr. Ishidi Yohanna Edith, Engr. Otis opined that, the introduction of the device purpose to help the country make economic progress by a way of making it 100 percent local production without necessarily import any part thereof. According to him, “the NSE has been at the forefront of the advocacy for the manufacture of Vehicle Speed Limiter Devices (VSLD) locally. On Thursday, March 17, 2017, we made this position known to the federal government when we paid a courtesy visit on the Minister of Science and Technology, Engr. Dr. Ogbonnaya Onu in Abuja. “From the preliminary information at our disposal, VSLD has a recommended retail price of Forty Thousand Naira per unit on the open market. In view of the Federal Road Safety Corps (FRSC), focus on commercial vehicles to immediately comply, it is estimated that not less than One million vehicles will install the device in the first year of its enforcement. This makes it a forty billion industry to start with. “The immediate outcome of the success of a local manufacturing industry of this nature to our country includes; job creation for our teeming youths, key among which are our graduate Engineers and Technologists, technology acquisition and advancement facilitating the potential spinoff of new products and a more robust value chain, relief of pressure on our currency on the international currency exchange market, diversification of the economy and a reduction on our asymmetric consumer import dependence”, NSE president highlighted. 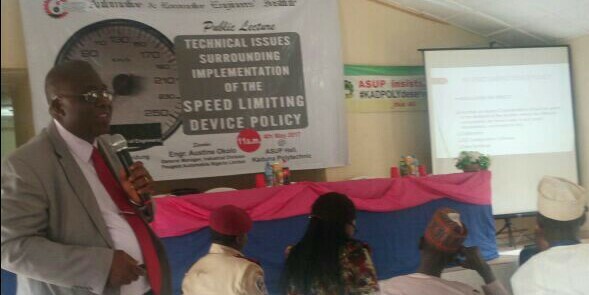 Delivering lecture on the theme, “Technical issues surrounding implementation of the speed limiting device policy”, General Manager, Industrial division, Peugeot Automobile Nigeria Limited, Engineer Austine Okolo who open the floor for discussion agreed that the device is good for the safety of lives of Nigerians but queried the manner it was introduced which has generated a lot of controversies from Nigerians since the announcement of policy implementation started three months ago. The auto don also stated that, in as much as high percentage of road crashes on Nigerian roads have been traced to over speeding and the need to see how that can be reduced by FRSC, the need to develop home-based software that are compatible with mechanical electronically control engines with modern vehicles is germane. Earlier in his welcome address, National Chairman of AutoEI, Engr. Zamani Ishaya said, the theme of the lecture was apt considering the availability of technical know how the country is blessed with and the need to engage them in technological aspect of the nation’s economy because technology remains the key driver of the global economy today.